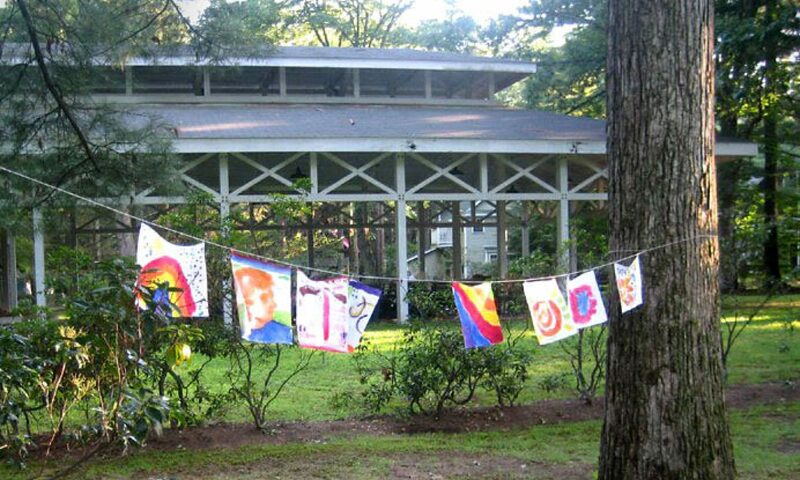 The camp at Laurel Park was founded in 1872 as a Methodist summer retreat and used as a site for religious camp meetings and other spiritual services. At the same time, it became a site for the popular traveling Chautauqua festivals of the era. The grounds were developed with the ideals of the Chautauqua movement in mind: as a place to gather and create an open air “university of ideas” focused on lifelong learning through nature, music, oration and the arts. This goal was the impetus for building Normal Hall and the Tabernacle, structures whose original purpose was to provide space for teaching and performing. Throughout the late 1800’s and early 1900’s Laurel Park was known as a gathering place where Pioneer Valley residents could come to be entertained, educated and inspired. Thousands of people came to traveling Chautauqua events on the grounds to hear the best-known speakers and entertainers of the day. It was the site of religious camp meetings and other spiritual services. At the same time, it became a site for the popular traveling Chautauqua festivals of the era. The grounds were developed with the ideals of the Chautauqua movement in mind: as a place to gather and create an open air “university of ideas” focused on lifelong learning through nature, music, oration and the arts. This goal was the impetus for building Normal Hall and the Tabernacle, structures whose original purpose was to provide space for teaching and performing. As other kinds of entertainment became more popular in the 1930s, interest in Chautauqua events and camp meetings waned. In 1968 the Springfield Camp Meeting Association turned ownership over to the cottage owners as the Laurel Park Association, which maintained the Park as a secular community. Around the same time, homeowners began winterizing their cottages as affordable year-round homes. In 1985, a homeowners trust was formed and they purchased the land surrounding the cottages from the Laurel Park Association. This allowed the Laurel Park Association (LPA) to become an independent non-profit whose mission is to carry out, in a smaller scale, the original ideals of the camp. In 2014, LPA started the Laurel Park Arts initiative, Explore this site to find out more about our current programs.